2014: Looking fantastic. Huge root and canopy growth, nice dark green all around. After taking this picture I cleaned the soil off the roots and repotted it into a slightly larger diameter rootmaker container. The tree was nearly 6ft tall including container. 2015: Looks about the same as last year, no significant new growth. Some of the oldest leaves are getting very yellow and overall color less green than last year. Somethere around this time I had stopped using liquid fertilizer and switched to only Osmocote Plus because with so many trees it was a huge burden to mix many gallons of fertilizer-water. Right before taking this picture I had repotted it into a 4" wider rootmaker pot, which has a diameter of 19", however, I did not clean the old soil off I just filled in around it. Over the winter those yellow areas all dropped their leaves and the same twigs died back. The newer growth stuck around. It bloomed but none of the fruit held. 2016: Here it is today during repotting. The canopy is smaller than it was 2 years ago, though the rootball is as large as ever and filled a 19" diameter rootmaker container. You can't see in the picture but it does have new white root tips around the perimeter. It had put out substantial new growth in spring but it still is overall smaller than its peak. It looks much lighter green than it once did. I regularly refresh the Osmocote and when repotting I still saw plenty of unspent pellets floating around. This time when I repotted I cleaned all the old soil out extensively. I planted it in the same 19" wide container but this time I planted it "higher" as after cleaning it had some roots hanging down that looked like they could begin to fill the lower third of the container. I've seen 15ft tall trees in containers this size so I'm skeptical that it really needs a wider one. So, I'm disappointed that it isn't thriving. I'm not yet worried at this point because the roots look great. When I repotted today the soil was mostly mud as the cedar chips had almost completely decomposed. I think not cleaning the old soil off last year was a big mistake. However, I thought that if soil aeration was limiting growth it would show up as rotted roots of which I found none. So, I'm stumped as to what the problem is here.... insufficient fertilizer or insufficient aeration? Other possibility is insufficient light, as the nearby apple trees at my old place were starting to grow in and shade it. At my new place all my trees get direct sunlight the entire day. My new greenhouse won't be ready until next year at least so all trees have to stay in containers until then, and I can't switch to sand/gritty mix because it is too heavy to carry. Nope, 5:5:1. That is, about half mulch, half peat, then some perlite thrown in. I've never add lime (or gypsum) because of the PH preference you describe, plus we have hard water around here that is somewhat alkaline. I looked at the Osmocote package and I think I haven't been using nearly enough. I wasn't following the directions and was just winging it but I think I guessed far too low. I also noticed that it describes how after the pellets are spent the empty husk remains, so me finding them when repotting is meaningless as they are likely spent. I'm thinking perhaps I can get one of those hose-attached sprayers where I can mix a quart of high concentration soluble fertilizer and it will come out at the target rate as it mixes with hose water. I'm not sure how accurate these are, though. I have about thirty trees so my old system of mixing fertilizer-water in 5-gallon buckets is impractical. In any case, the mix does seem to work quite well for me until the bark rots and it ends up effectively ~90% peat/composted bark, which happens faster than I expected given the low quality of the cheap mulch. I have been thinking about switching to CHC instead of cedar mulch for containers, or just use the Miracle Grow soil. I am looking forward to getting these in the ground. Again, no expert. If you don't add a source of calcium, I think you'll always have a deficit no matter how much fertilizer you use. I'm not sure how available the calcium in the hard water is. The water would have to be acidified before it becomes calcium ions. People who are smarter than me on this, could there be some calcium deficiency? Thanks guys. I think I will reduce the peat content from here out. I'll have to be more careful about keeping them watered, though. Vanman, I read somewhere that calcium deficiency is extremely uncommon in citrus. I don't remember the source but I know my hard water is chock full of calcium. However, other nutrient deficiencies are quite common so if I'm underfertilizing thats certainly a reasonable thing to see here. Do you use the Miracle Grow Garden Soil as is, straight out of the bag, with nothing else added? And how long can I expect the medium to last before I should change to new soil? Great to know that you can still reuse the old soil. Thanks! When I repot I fill a wash bucket (aka keg bucket) up with water and put the tree rootball in it. I loosen the soil underwater so there is less tugging on the roots from gravity, plus any any ant nests are drowned. All the perlite floats to the top and the peat sinks to the bottom. I recently read that peat moss doesn't decompose further so I reuse both it and the perlite forever, just adding woodchips back to the mix. This has the added advantage of having pre-wetted peat which is otherwise difficult to wet initially. RootMaker air-root-pruning containers stimulate extensive root branching, but the advantages do not last indefinitely. Root branching increases and increases, reaching a maximum, then, if transplanting does not occur, benefits begin to DECLINE. This occurs because there is a limited amount of space in any container, and as that space is filled with roots there is little space for new root development. Plants can run out of space and stagnate, even though there is no root circling. 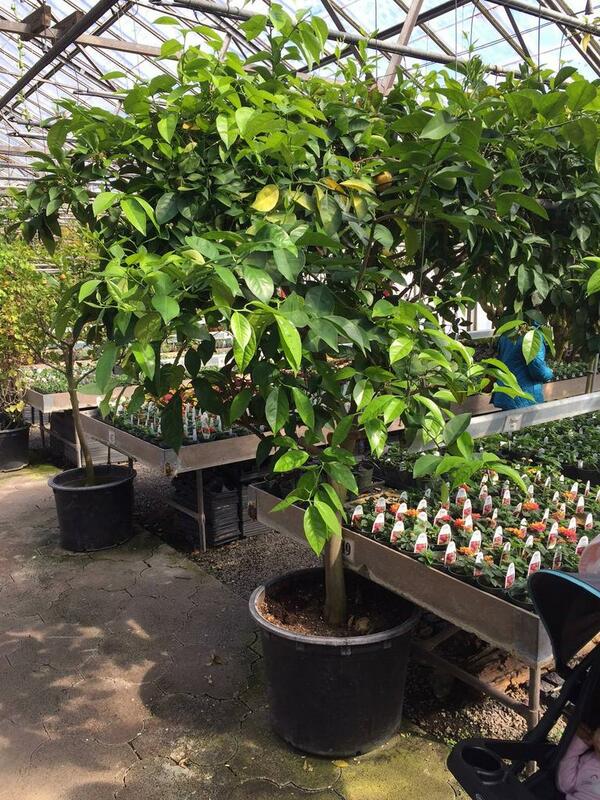 If you do not wish to keep increasing into a larger and larger container, then you can remove the tree from its present container, trim off 5 or 6 CM (2 - 2.5 inches) from the sides and bottom of the root ball then replace the tree back into the original container, and fill the empty space with new medium. There is a common belief that the foliage of the tree should also be trimmed back to match the trimmed root ball. There is conflicting thought if this needs, or does not need to be done. Do whatever you think best. I don't trim back the foliage. The leaves provide support for the development of new roots. - Millet"
Millet: is this the Miracle Grow Garden Soil that you're using? I got 3 bags of these. There's another kind that's also MGSS, but it states for "Herbs and Vegetables, Moisture Control", I didn't want any Moisture Control, so did not buy those. Even though it says "for in-ground use", you use it as a container soil? Obviously you have great results. What makes a soil mix suitable for "in ground" use as opposed to "potting soil"? Potting Soil to me means good for one or two years or even less as a potting mix. They tend to decompose quickly and many people have been stuck with a mushy mix too soon for the most part. I had some MG PS that either had black gnats in the bag or the gnats found it very quickly. They almost ruined some tomatoes I started from seed. Other forums have mentioned the same problems. I think the MG Garden Soil says to add it to existing beds only suggesting it's too good by itself or not good enough by itself depending on your guess it seems to me ! It was a good bit less expensive when I bought it and I thought it was a bargain. I had not used the Garden Soil earlier because of its instructions. I missed or forgot that Millet and others were using it with great success. Independently I figured out I did not like the potting soil but I liked the garden soil. To me it was much better and easier to use. I have added commercial composts like Black Kow to soils that were too wet or too dry natured in the south east US where I am. Different places are less known to me but compost is well own for its benefits. It does not seem to get mushy and it improves soil structure. It can be expensive or it can even be free depending on local green efforts. Black Hen is much 'hotter' but very good. Other local composts could be very good too. I hope this helps. I have added commercial composts like Black Kow to soils that were too wet or too dry natured in the south east US where I am. Different places are less known to me but compost it well own for its benefits. It does not seem to get mushy and it improves soil structure. It can be expensive or it can even be free depending on local green efforts. Black Hen is much 'hotter' but very good. Other local composts could be very good too. I hope this helps. I usually add some worm casting to whatever "potting soil" that I use, along with some myco and azomite. I think your messing with it too much and stressing the poor thing out. Didn't you write that there were no dead roots, they were white and healthy? I have all my trees in RootMaker type containers. They can stay in them for a long time due to the root tip pruning affect. Leave that root ball intact when you upcan! If you're paranoia about organics decaying prematurely then use more inorganics in your mix. I use a 50/50 mix of organics/inorganics....whatever is on the shelf or in a pile outdoors - pine bark, compost, peat, builder's sand, vermiculite, cedar chips....no biggie. I use a lot of vermiculite cause it's light and mix it with my tractor's bucket. Here's my Moro. Been in that container for at least 4 years. Mark, I'm impressed that your tree looks so good in the same container for so long. Mine clearly had issues as it was in a slow decline over 2yrs, so I knew something had to give. Perhaps it was limited light, not enough fert, I'll never know. I can say I've never regretted aggressively repotting a tree, they always seem to look better soon afterwards. I realize this topic is quite old, but I think it makes sense to glom onto it for my own purposes, which relate somewhat to the original post. 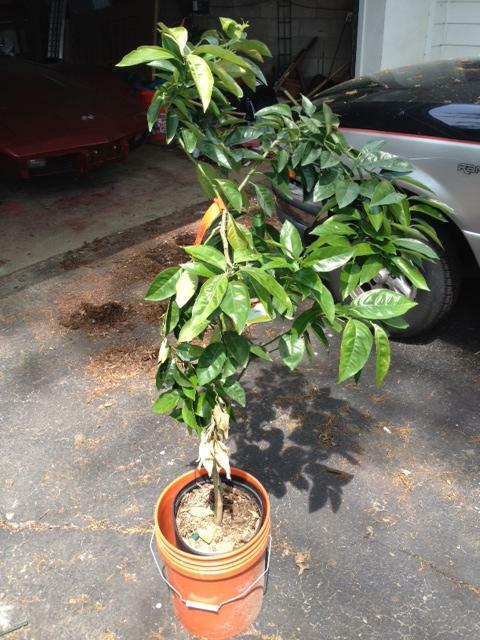 Brian, I hope you were able to achieve more success with your Orange tree in the RBII container. Have you moved to the greenhouse yet, or is the tree still in container. I'd love to know what you did to (if anything) to improve the situation. I have a small "grove" of citrus trees in containers, aging 3-7 years now. I planted the trees in three-quarter high 55-gal food-grade containers. Most are raised off the ground with large 2" holes drilled in the bottom. A few are on ground because they were so heavy I wasn't able to lift them enough to add "bricks" to raise them. I suppose those might also be rooting through the holes somewhat too now. I've also been fertilizing with Osmocote Plus recently, and before I was using organic liquid fertilizers and foliar spays. The trees had a few good years, but I expect they are heavily root bound at this point. I do prune them yearly to keep them to a smaller size. I think the root bound condition causes them to drop a lot of fruit in the hot summers here when the water just passes through the roots and doesn't cling to the limited soil left in the containers. The reason I'm posting today is that I've noticed in the new growth from after the pruning early Winter (maybe it was around Oct '17 the pruning took place); I'm noticing my Robertson Orange and a Eureka Lemon showing a lot of Yellow leaves. On the Robertson, the leaves are yellowing in some areas of the tree and perfectly green in others. It almost reminds me of the fusarium and verticilum conditions on an infected Tomato plant. We've had a lot of rain the past month, so the soil has been fairly damp, but I believe it's still draining well. It's a mix of perlite, peat, redwood chips, some organics and more recently a top-off with coco hulls. I hit the trees with liquid iron and few weeks back. I don't think this is nutrient deficiency, but I can't say what it might be. Any thoughts on the cause? willus I did move this tree into my new greenhouse this winter, though I was only keeping temperatures just above freezing at night. The tree continued to drop leaves and have some twig dieback since my last post in this thread. However, the spring bloom has just come for all my trees in this past month and this tree put out leaf flushes all over. So while it still isn't any larger overall it appears to be bouncing back and I expect it remain healthy from now on. I had repotted it into a 5:1:1 ratio mix (instead of 5:5:1) and tripled the amount of osmocote that I was providing. This tree has had some issues with cottony cushion scale which I am still fighting, but spraying with soap water had kept it in check. Once the current flush hardens off I will start using horticultural oil spray. Here it is today. All most all of the leaves you see are brand new leaves that haven't fully expanded yet. These just sprouted in the past few weeks. They should get as large as the old leaves. Also, the buds right around where these leaves sprouted from have lots of little green "hairs" that I hope indicate another flush will come soon. If you are sure drainage is good I am not sure what to suggest. Are they getting enough light? And is the root zone staying warm enough (>55F) when it is sunny? For nutrient deficiency and disease suggestions I am afraid I am not good at diagnosing these. Perhaps somebody else on the forum can offer some suggestions on that. Hi Brian, thanks for sharing an update. Looks like you found a nice corner in the green house for that tree to thrive. Your RBII container looks a bit ovoid, which could be improved on with a bit more muscle when packing it in. That nursery tree is impressive. I can't see how a 25-Gal Post would support a tree of that size without it becoming totally rootbound. I wonder if they root prune or recently re-potted it. The tree looks to be 8+ years in age. As for my citrus, they get a good 8-hours of morning to early afternoon light where I have them positioned. I purposefully placed them on that side of the house to try and limit the amount of afternoon light they get, as we have 110F temps highs for many of the summer months. It's helped a lot. How much Osmocote have you been feeding the trees, and how often. I'm only giving each tree around half a cup mixed into the top layer of mulch and coco hulls. I suppose the tree could just be starved for more nutrients. They did also recently receive a good soil drench of AACT (Compost Tea). 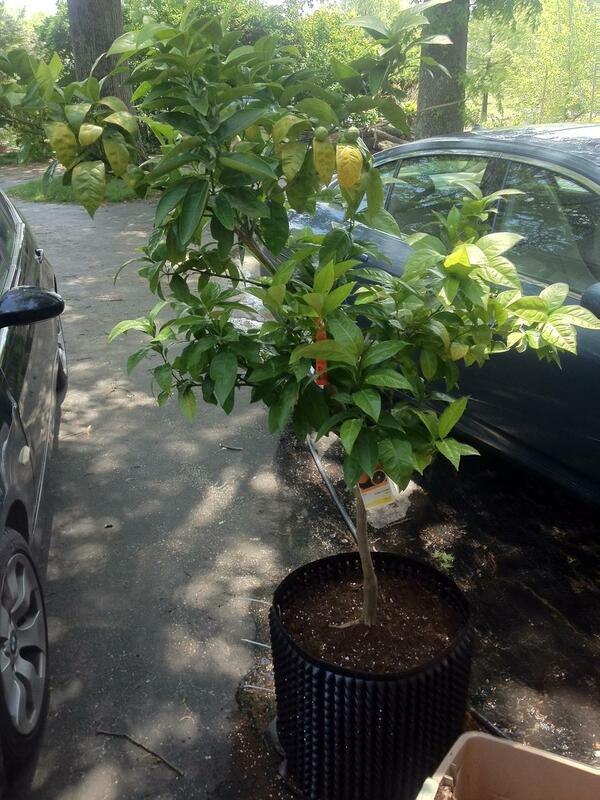 Keep us posted on how your orange tree takes. I'm interested in general, but also because you're growing in RBII containers, a solution in which I recently invested heavily. Hah yes the pot is squished because I had to keep moving it around and a bunch of soil fell out of the bottom. I filled it back in lazily, I will fix at some point and hopefully get it in the ground soon. I have been giving about a half cup of osmocote per season, plus I throw a small handful in whenever there is a new growth flush starting. I haven't measure much closely, all I know is that since I started increasing the amount of fertilizer last year new growth has been nice and green instead of pale as it was before. I'm not sure what else to recommend for you as it sounds like you are taking good care of your trees. Hopefully somebody else can offer advice. Z--Willus, it looks like your trees has a bit of nitrogen deficiency. Nitrogen deficiency shows up on the OLDER leaves while the newer leaves still have some green coloration. Depending on the amount of deficiency, a nitrogen deficiency shows up as totally yellow leaves with no variation of color, and for a lesser deficiency problem, yellow-orange veins with some green out on the sides of the leaf. Hi Millet, that's what I was thinking as well, but I wasn't sure if it might be due to something else. I have another Orange tree of the same age and perhaps larger than this one. It has the same grow medium, but it gets more shade in the afternoon (maybe 1-2 hours more). At any rate, I was scratching my head as to why this tree was showing the yellowing (and the leaves were newer leaves, say <1-year old). So the solution is to what, hit these trees with yet more N? More Osmocote Plus? Urea? Hmm. 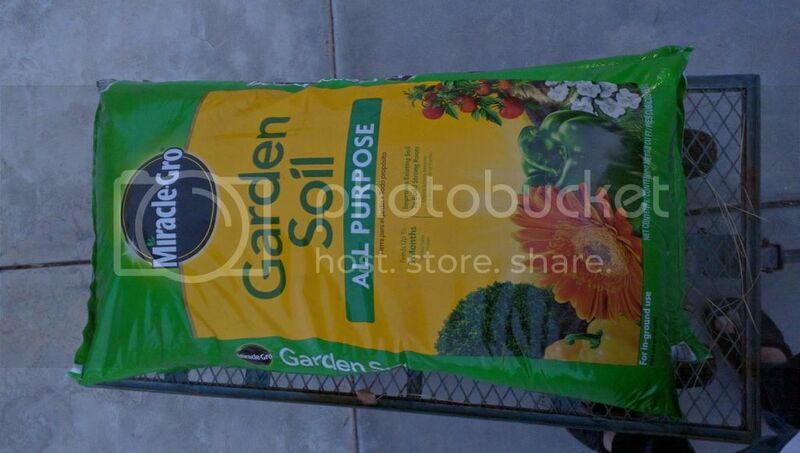 Does Miracle Grow Garden Soil contain "bio-solids", a.k.a. sewer sludge? Miracle Grow Garden Soil (MGGS), does not contain Bio-Solids. I have quite a few citrus trees growing in Z- MGGS, some for several years. MGGS has a good amount of bark fines and the drainage is good. However it seems that in different parts of the country, the formulation of ingredients is somewhat different. Z-Willus, if you fertilize your tree with Urea, be 100% sure that you ONLY use low-biuret urea, otherwise your tree could get leaf yellow tip, which cannot be corrected.